The teaching diploma is offered for both music and dance, with specific admission and course requirements for each specialisation. - have successfully completed at least the first year of master’s-level studies at the Lyon or the Paris CNSMD in the relevant specialisation. This course is offered in the following specialisations: violin, viola, cello, double bass, flute, oboe, clarinet, bassoon, saxophone, horn, trumpet, trombone, tuba, piano, percussion, harp, organ, accordion, guitar, early music, singing, choral conducting, accompaniment for teachers, writing, musical culture, jazz and electro-acoustic music composition. The core programme is based on several aspects of teaching and several periods of training or observation in state-recognised music schools. The course takes two years to complete and no reduction in the length of the course is possible. 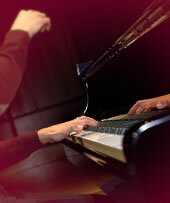 This course leads to a Music Teaching Certificate in the specialisation chosen by the student. The course content and the work done throughout the course enable the student to obtain 120 credits and the ‘grade de master’ diploma in pedagogy and teacher-training (officially recognised as being equivalent to a university master’s degree).